The Beautyrest Twin Size Plushaire Express Air Bed with Hands Free Pump is ideal for an extra guest bed air mattress. The raised channel beam construction provides ideal ergonomic support for maximum comfort. Your guests won't believe they are sleeping on an air mattress with the built-in pillow, which provides bed-like comfort. The hands-free electric express pump inflates/deflates mattress quickly and includes a bonus adapter for use with all household inflatable's. The Beautyrest Twin Size Plushaire Express Air Bed with Hands Free Pump has many exciting features for users of all types. See the Beautyrest Twin Size Plushaire Express Air Bed with Hands Free Pump gallery images above for more product views. 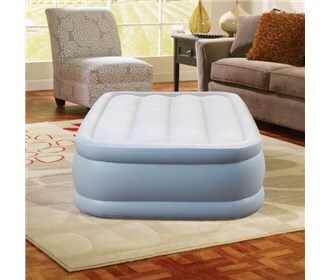 The Beautyrest Twin Size Plushaire Express Air Bed with Hands Free Pump is sold as a Brand New Unopened Item.